A quality of life bond project that was implemented horribly has not finished sucking up our money. Now the city is considering issuing $700,000 of certificates of obligation to build bathrooms for San Jacinto park. We all know that current city management did not create the San Jacinto mess. We have the prior group to thank for that. This entry was posted on Sunday, July 16th, 2017 at 5:00 AM and is filed under City government. You can follow any responses to this entry through the RSS 2.0 feed. You can leave a response, or trackback from your own site. Do not put restrooms at the Plaza. Years ago, the plaza had restrooms and they had to be closed because homeless transvestites were living there. It became very dangerous. There would be no way to monitor them. And, I agree, why is there a need for restrooms there anyway. The downtown events bring in portable toilets. Council — think it through, for a change. Restrooms at the Plaza Park ??? The city went thru that debate several years ago, BEFORE re-construction and it was toooooooo costly to maintain. Sure, they can BUILD them, but, ongoing maintenance and constant cleaning was the problem. After the first: Take your pick: . ..sick young person from drinking all night at the downtown bars, or transient or Hobo crapping and peeing all over the place, babies being born there, robbery done to others while they are peeing, a dead hobo (as has happened 40+ years ago when they had restrooms) . . “Maybe a killing”, who knows, the restrooms will be closed all day. Is was discussed that it would need 24/7 maintenance, 24/7 armed security from getting robbed with your pants down, and after the first good pee and vomit soaking, would no longer be “Open to the public” for hours or the whole day. Seems like. . . . MOST/ “over 50%” of everyone downtown is . .Injured, limping, in a wheelchair, on crutches, or missing and arm or a leg or an eye. . . . that is walking around downtown. So, would need MORE than normal, handicap facilities. And then, there are those that will want to SLEEP and Take Shelter in a Public Restroom, downtown, during the winter, rain, cold, etc. Tearing up what was just finished (Paint is still drying) on the Plaza re-construction from a few months ago. And of course, . . . Bring your own toilet paper, cause . . . there ain’t gonna be any ! Also, bring high top rubber boots too, cause the floor is gonna be wet. Really wet and soaking, with everything you can think of. 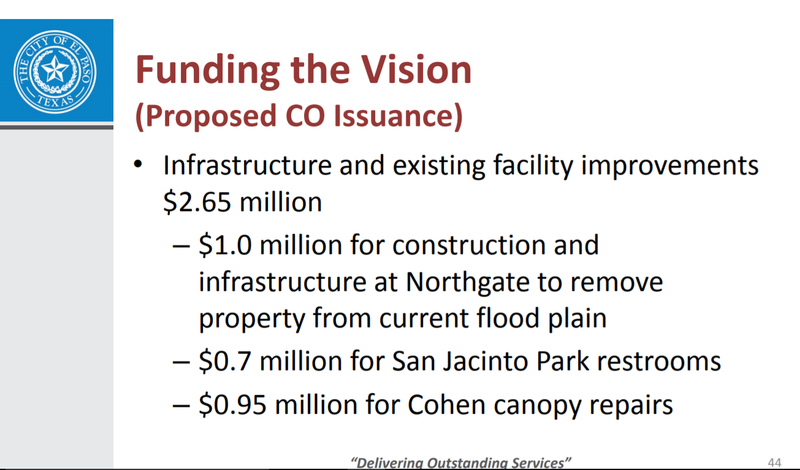 Too bad the City didn’t allow Mr. Foster to pay for San Jacinto renovations, as he wanted. Mr. Foster probably would have put in restrooms or at least the City could now hit him up for restrooms. So many times the City shoots itself in the foot and we who live here allow it to happen. I don’t see the point at this late date, frankly. For one thing, there should not be any need for folks to spend that much time since there are no longer any buses to be found around the area. And, within the confines of the Plaza, what, exactly, is there to attract anyone?